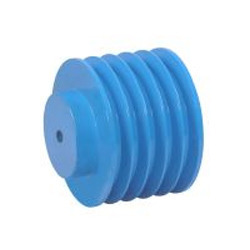 We have gained expertise in delivering a quality range of Solid Pulley to our prestigious customers around the country at cost-effective prices. Meticulously manufactured by our engineers following modern methodologies and techniques in the fabrication process, these belt pulley are highly suitable for numerous applications in transmission systems of several industries. Furthermore, to meet the variegated requirements of the client, these products can be easily availed in customized forms as per their myriad specifications.